What Day Of The Week Was January 31? 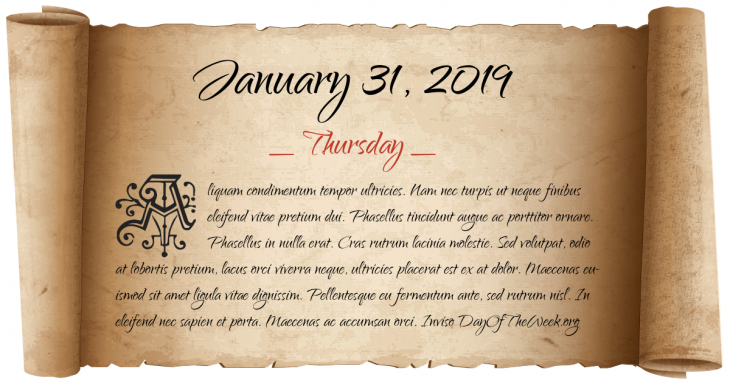 January 31, 2019 was the 31st day of the year 2019 in the Gregorian calendar. There were 334 days remaining until the end of the year. The day of the week was Thursday. Yugoslavia’s new constitution, modeling the Soviet Union, establishes six constituent republics (Bosnia and Herzegovina, Croatia, Macedonia, Montenegro, Serbia and Slovenia). A North Sea flood causes over 1,800 deaths in the Netherlands. Explorer program: Explorer 1 – The first successful launch of an American satellite into orbit. The Winter Soldier Investigation, organized by the Vietnam Veterans Against the War to publicize war crimes and atrocities by Americans and allies in Vietnam, begin in Detroit, Michigan. An explosives-filled truck rams into the gates of the Central Bank of Sri Lanka in Colombo, Sri Lanka killing at least 86 and injuring 1,400. New Year’s Day in Chinese calendar. Start of the year of the Wood Horse in Chinese astrology. Who were born on January 31?